You can download a single song for $.99 or the entire Return Album for $9.49. [Clips are available – below – to help your choices]. 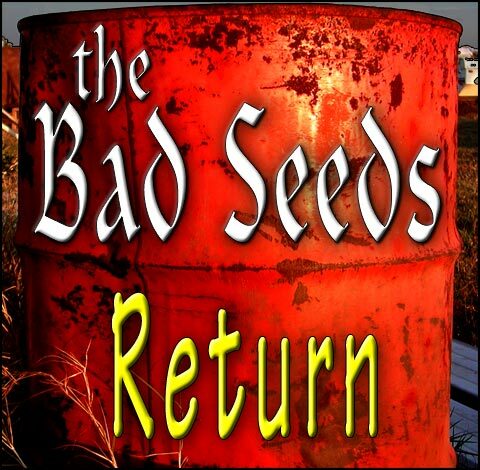 “Test drive” some of The Bad Seeds original music. Choose from any of the 16 Tracks. Recommended Tracks – indicated in red. Track 1 — [1:13 clip] — “It’s not the 60’s no more” No kidding. In fact, it is anything but the time we grew up in. Track 2 — [0:59 clip] — TV2 is about the powerful images we see on television – are we seeing the route to “freedom” or the road to hell. Track 3 — [0:34 clip] — There are times when you meet someone and they motivate you to do things that you wouldn’t normally be able to do. Track 4 — [0:58 clip] — This one is about the all-important love song. Remember when the band played the “slow” ones? Track 5 — [1:13 clip] — Remember those places you could go when we were too young. Track 7 — [0:51 clip] — This is one of those songs that plays on the double meaning. You either get it or you don’t. Track 8 — [0:58 clip] — One of those “he said…, she said” songs that discuss the necessity of going to one of the Bad Seeds socials. Track 9 — [0:58 clip] — Trying to decide if you wanted to continue “going with” someone was a matter of staying in the vehicle or leaving. Track 11 — [0:58 clip] — This song may be a BadSeeds anthem. Well, this music tries to address how we have all felt at one time or another. Track 13 — [0:56 clip] — The lyrics reflect an internal, emotional compromise, more or less. Track 14 — [0:48 clip] — Only in your dreams would this be true. Track 15 — [0:56 clip] — Usually it the unanswered question. Why do I bother? Track 16 — [0:57 clip] – In every town, there is an “after hours” place that people go.